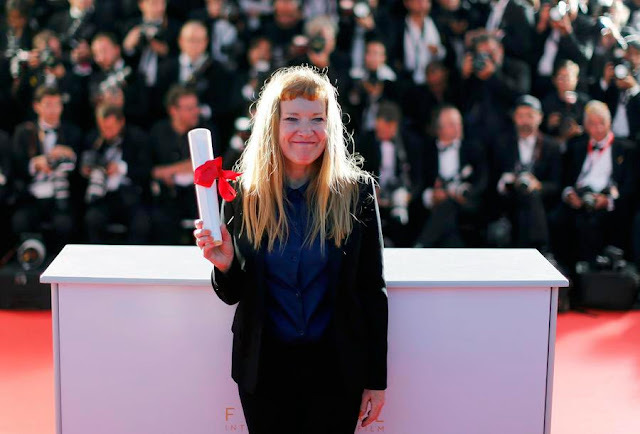 Andrea Arnold won the "jury prize "for “American Honey (UK)” on May 22 at the Cannes Film Festival. It was a strong contender for the Palme d’Or and the third best favorite of the jury. The prolific and talented Arnold has received the second most jury prize awards for "Red Road", "Fish Tank" and "American Honey" after the record set by Ken Loach (UK), this year's Palme d'Or winner. This year, the Palme d'Or was never closer to her grasp and many critics praised the film as the best. "American Honey", more than other films in the official selection, was the most cinematic with highly handcrafted visual architecture and superb mobile camera work and framing. The continuity editing is brilliant and the film serves not only as a road journey for the characters but for the spectator. A youth caravan travels across middle America selling phony magazine subscriptions stewarded by an “Oliver Twist”-like ”Fagin” called Jake (Shia La Beouf) and his boss Krystal (Riley Keough). Her practice is to belittle the crew and recruit a lover from among their ranks; Jake is the current paramour. These young people become a family and occasionally recruit new sellers such as Star (Sasha Lane), an 18 year old young woman from Texas. She claims her name was given to her in homage to the “Death Star” of Star Wars mythology. Elsewhere in the film, references are made to Darth Vadar. Jake also keeps a gun that he threatens to use on a few occasions. But the film never turns completely dark and is reverently respectful of this motley crew of young people. Star is a case in point who comes from a broken home where her father molests her and her mother has abandoned her family preferring to spend her time at a bar doing line dancing. There are two younger children that live with Star and her father and when we first meet her she is hitchhiking with them to get back home.The caravan is thrown into the wilderness of small town USA and the crew is even compared to wild animals. Moreover, there are numerous animals in the film such as a caped Superman dog, a turtle, horses, a variety of insects and a brown bear. The animals never pose a danger but the young people are prey for middle aged men who try to take advantage of the young women, in particular Star. In the evenings, the crew lives in cramped rooms at cheap motels. Group activities include beating up the seller who did the worst job of the day, though this is done in an a spirit of playfulness The camaraderie the young people show each other is what makes their job so captivating since most come from broken homes. They engage in a lot of singing and dancing so it is a joyful saga as well as a chronicle of despair for the economic conditions of working class USA. Krystal targets the very wealthy or the very poor for the magazine sales and it is fairly clear that none of these people will ever receive their subscriptions. Besides, today there are not many eager customers for magazines with free reading material readily available on the Internet. Three films in this year's Cannes official competition have tackled important social and political issues of today: “I, Daniel Blake” (Palme d’Or reviewed here), “American Honey” and “Aquarius” directed by Kleber Mendonça Filho starring Sônia Braga. Braga plays a 65-year-old woman who refuses to sell her rental unit to a housing company. This situation is common for many global cities today such as San Francisco. Not far from the Cannes festival is the sovereign state of Monaco. ("Principauté de Monaco"). Below the Royal Palace is a huge banner strung across the streets of old rental units advertising "Commercial Space Available for Condominium Sales”, for this is a state where the wealthy have succeeded in owning virtually everything. These excellent films reflect the effects of globalization, increasing economic disparity and the commodification of the housing market by corporate greed. The characters of these films represent “Ulysses in a Strange Land”, trying to make sense of why the road map no longer points the way back home but how close to the edge an increasing amount of the working class has become, in particular the young.